When I found out I was the lucky winner of Not So Big Remodeling: Tailoring Your Home for the Way You Really Live I was just thrilled to win a book on one of my favourite topics, home renovation; I didn't know what a wonderful resource this book is going to be. 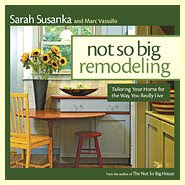 Taking her mantra of "build better, not bigger" Sarah Susanka and co-author Marc Vassallo have presented a go-to resource book on sustainable design for homeowners and architects alike. Using her own classic Cape style house as an example Susanka offers three options for efficient remodeling: work within the existing footprint; consider a small bump-out and lastly build an appropriate addition. Often minor changes are all that are needed to fix an awkward layout or improve flow within the house and the authors always emphasize integrating the old with the new so the house is cohesive and aesthetically pleasing. Although we are living in a larger house, somehow it never feels imposing. Sarah Susanka explains why: it's all about proportion. "It is possible to design a house where everything looks in proportion, but when you approach the house on foot you realize it is out of proportion to our human bodies". I'd go further and say a lot of houses built or remodeled in the recent past don't fit the scale of the surrounding landscape either. The authors challenge the reader to really consider the way we live in these big spaces and offer smart solutions to make them feel more comfortable. Not So Big Remodeling is glossy enough to keep on the coffee table yet packed full of plans and blueprints and I would be happy to own it for the photography alone. Many of the houses featured have beautiful natural wood trim and doors with a Craftsman ethos that is immediately appealing. But there's so much more to this book than obvious visual appeal, it contains tips and ideas on every page that can be incorporated into any remodeling project - large or small - including the updating of Beach House. Thanks Susan at Homedigz.com for adding this book to my remodeling resources. That sound like a great book! Thanks for letting us know about it. She is one of my favorite writers in all matters of small homes. It is where I stated to see and understand the concept of eking out every square inch our home. That details is where the "wow" factor is. I haven't had a chance to read this book yet, so I appreciated your review. Sounds good! Congrats on winning it!